Before we begin... This version of our Warm Golden Sunsets tutorial is for Photoshop CS5 and earlier. For Photoshop CC and CS6, see our fully updated version, which includes a video of this tutorial. In this Photoshop Effects tutorial, we're going to look at how to easily improve and enhance a photo of a sunset using a Gradient Map! When I think of the perfect sunset photo, my mind immediately fills with lots of warm reds, oranges and yellows as the sun gently sets across the water or beyond the hills. 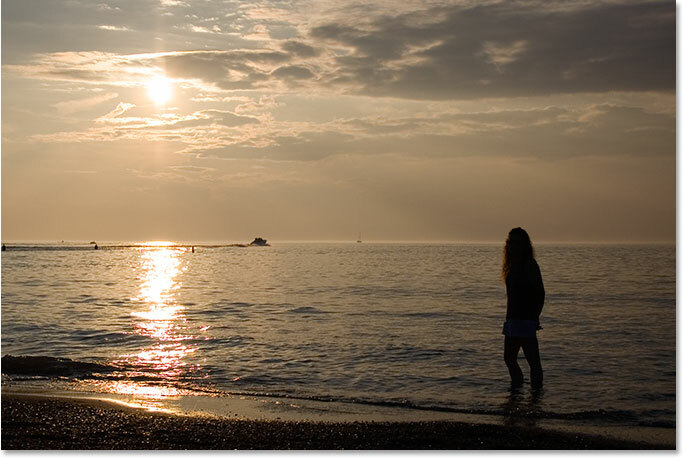 Sunsets are one of the most commonly photographed aspects of nature, and yet photos rarely manage to capture their intense beauty. What was once a sky filled with rich, golden hues often ends up looking cooler, less vivid, and ultimately less interesting. I like how the sun is getting ready to dip below the horizon as a boat heads out across the lake, but the colors are quite muted and dull. They could definitely use a little help. If you've been following along with our tutorials for a while, you know that in most cases, the very first thing we do is duplicate the Background layer, which allows us to work on the image without harming the original pixel information. In this case though, we're going to be using one of Photoshop's adjustment layers, and one of the great things about adjustment layers is that they allow us to work non-destructively. In other words, we get to work on the image without actually touching it! Photoshop gives us a complete preview of what the image looks like after making our adjustments, whether we're using a Levels or Curves adjustment layer to improve overall image contrast, a Hue/Saturation adjustment layer to colorize an image, or a Threshold adjustment layer to find the lightest and darkest parts of the image, but all of the work is actually being done inside the adjustment layer itself. None of it is being done directly to the image. We'll save a big discussion about adjustment layers for another tutorial, but for now, just know that nothing we do with the Gradient Map adjustment layer we're about to add will harm the image in any way, which is why there's no need to first duplicate our Background layer. Clicking on the "New Adjustment Layer" icon. Select "Gradient Map" from the list. The Gradient Map dialog box. Photoshop's Gradient Map feature gets its name from what it does. It allows us to "map", or assign, different colors to different tonal values in the image. We can use a Gradient Map to make all dark areas in an image one color, all light areas a different color, and all mid-tone areas yet another color. We can say "I want all dark areas to be blue", for example, and "I want all light areas to be red, and all mid-tones to be green". I'm just using random examples, of course. You can choose any colors you like! In fact, you can divide the tonal range of an image into a rainbow of colors if you want, and since we're working with gradients (hence the name "Gradient Map"), Photoshop will create smooth transitions between the colors for us. The image appears black and white with the default gradient. Edit the gradient by clicking directly on the preview area. This will bring up the Gradient Editor which we'll look at next. Double-click on the black color stop. 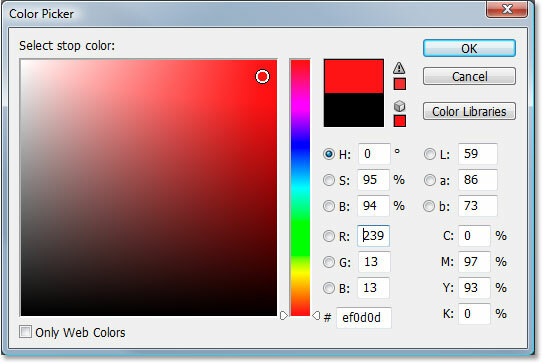 Selecting red from the Color Picker. The dark areas of the image are now red. Click OK to exit out of the Color Picker when you're done, but don't exit out of the Gradient Editor just yet. We still have to change the color for the light areas. 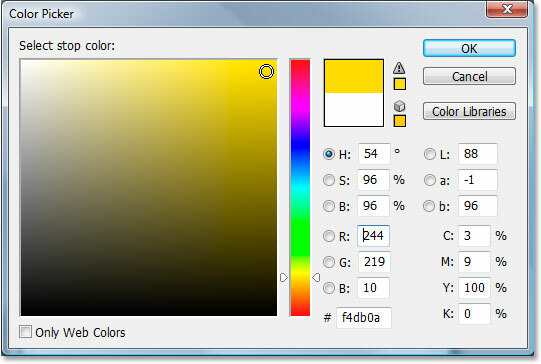 Selecting a yellow color from the Color Picker. The colors in the gradient have now been changed. The image after editing the colors in the gradient. Unfortunately, the colors aren't really blending in with the photo all that well, but we're going to fix that using Photoshop's layer blend modes and the Opacity option next! Step 5: Change The Blend Mode Of The Gradient Map Layer To "Overlay"
We've added our Gradient Map adjustment layer and successfully edited the colors that are being mapped to our sunset photo using Photoshop's Gradient Editor. The only problem now is that the colors are much too strong. There's two things we can do to fix that, and we're going to be combining both of them to give us complete control over the final result. Change the blend mode of the Gradient Map adjustment layer to "Overlay". 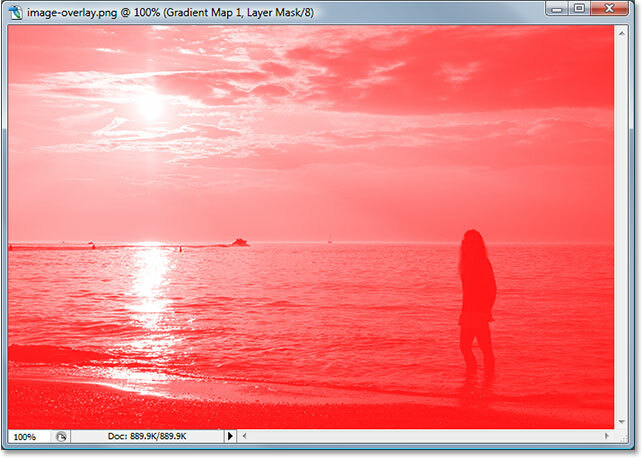 The image after changing the blend mode of the Gradient Map layer to "Overlay". Lower the opacity of the Gradient Map layer to reduce the color intensity. And there we have it! That's how to use a gradient map to enhance the sunsets in your images with Photoshop! Check out our Photo Effects section for more Photoshop effects tutorials!